We’d love your help. Let us know what’s wrong with this preview of Dont make me think by Steve Krug ZHU. 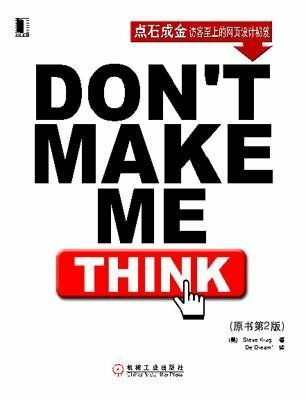 To ask other readers questions about Dont make me think, please sign up. Embarrassed to say; I had not read this one. It is kind of a must read. But on the other hand, most of the time during reading you go "I know that!" then in between the lines are little golden nuggets of knowledge, humbling you. Un libro útil para cuando empieza ha realizar prototipos de tus primeras páginas web. Cómo programador se nos hacen fáciles muchas cosas, es imposible perderse en una página web creada por ti mismo, el libro te ayudará a tener más empatía con el estúpido usuario.